Justin Bieber on the phone with a shark in the back seat. Think Justin could turn the shark into a Belieber? I doubt it. Today we took the boys to see The Secret Life of Walter Mitty. I won’t ruin the movie for you if you’ve somehow managed to escape the myriad trailers this holiday season, but I will warn you that it may make you want to travel. 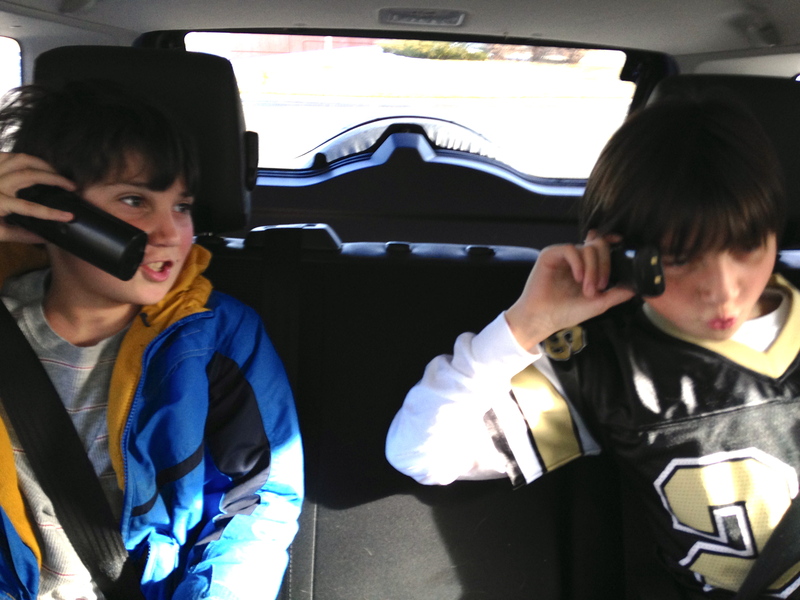 After the film on our way home, our boys who, like Walter Mitty, have very active imaginations, began having crazy phone conversations in the back seat of our car using some old telephone handsets they found in the cargo area. I was only half listening while talking about the film with my husband, but at one point I believe Joe was a shark and Luke was Justin Bieber. I love my sons’ imaginations, and it’s in precisely those moments that I deeply appreciate our left-brain dominant boys and their non-stop creativity. The other night we were discussing what life might be like if we had to exist in the present with Tyrannosaurus Rex looking into our second story windows as we were getting ready for bed. Adults never have conversations like this. It’s a shame too because it would make dinner party conversations far more interesting and it would keep us from bickering about politics and religion. Thinking about Walter Mitty and his daydreams I keep coming back to one thing. Creativity and imagination are far too underrated in this world. You have to dream it before you can do it. Someone imagined flying before the Wright Brothers actually flew and someone envisioned walking on the moon before Neil Armstrong ever did it. American society praises innovation and creativity as if we were the first upright beings to employ them. One look at our schools today, though, and you see that we talk a good game but we don’t play it. There is little room for imagination, creativity, and out-of-the-box thought at our public schools, which are instead consumed by standardized tests meant to make sure all kids measure up to the same rubric like faceless automatons. We’ve somehow determined that this is the best way to get ahead in the world, by engineering our future generations to a measurable standard. It’s sad, really. The kids who think differently are passed along because no one wants to deal with them. Their skills are undervalued and lost. We are systematically eradicating they very things that make us uniquely human…artistry, creativity, and independent thought. We squash imagination in the name of forward progress, but imagination is the one thing that allows progress in the first place. My dyslexic kids might not fit into traditional schools because they think differently than other kids, but because of them I see possibilities. I see life and the world differently than I used to. I think “why not” instead of “we can’t.” And, maybe it’s crazy, but I sure would like to see that conversation between Justin Bieber and a great white shark realized. Somehow I think that could only make the world a better place. A funny thing happens in art. First (age 2) we make anything we want and are praised. Next (around kindergarten) we’re taught to stay in the lines, make all tree trunks brown and all tree canopies round green balls. As we mature into teenagers, art takes a back seat as an elective, pursuit of arts is discouraged unless you have “natural talent” (by which we mean $cholarships and career$). When we try to pick up arts (I’m most familiar with painting), we have to re-learn all over to throw off the manacles of green tree/blue water, back to where we can be creative and express ourselves. Back before it was all taught away. Spot on, Paz. Creativity is a use-it-or-lose-it proposition. I praise my sons’ creativity when I catch it in action because I want them to know it is valued. Life is so much more interesting when you allow yourself to color outside the lines as necessary.